Comfort: Smooth running with low vibration levels is achieved through a dynamically-balanced design incorporating highly efficient rubber isolation. Lower engine speed together with an inlet air silencer reduces noise levels and contributes to increased onboard comfort. 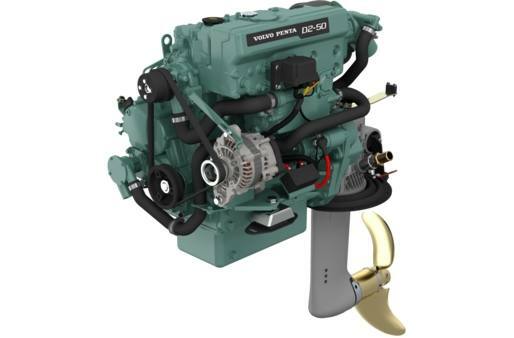 Solid and robust engine package: With a rigid engine block and a one-piece cylinder head, this Volvo Penta marine diesel engine is designed and built to be immensely strong. Together, the engine and Saildrive form a solid, robust and highly efficient package that is easy to install. Efficient charging: High-capacity charging is standard. The 115A alternator has an electronic sensor which enables a higher battery capacity. Even at idle speed, the alternator gives more than 35A, and at cruising speed it de¬livers approx. 100A.